You can find the answers to some frequently asked questions below. Q. Aren’t you just a group of middle-class left-wing activists? Extinction Rebellion is made up of people of all ages and backgrounds from all over the world. From under 18 to over 80 year olds – there are thousands of people willing to put their liberty on the line to fight the climate and ecological emergency and protect biodiversity and atmospheric health. We don’t align with any political party and welcome people who vote for all political parties and none. We are working to improve diversity in our movement. We don’t think it is helpful to set this up as a fight between the “left” and the “right”, we have an enormous challenge before us, we believe we need to lay down our differences and find our common ground. Q. Who is behind Extinction Rebellion? Extinction Rebellion is a movement made up of people from all walks of life. It started in response to the IPCC report that we only have 12 years to stop catastrophic climate change and our understanding that we have entered the 6th mass extinction event. It started small and was launched in the UK on October 31st 2018, it has grown very quickly and there are now about 130 Extinction Rebellion groups across the UK from Cornwall to Sunderland to Glasgow and there are groups across the world. The majority of people who work for Extinction Rebellion are volunteers, a small percentage is receiving living expenses. Decisions are made based on a model of organising called a “self organising system” – people do what they can according to the skills and time they can offer. A: Extinction Rebellion has come about as a result of academic research and mass engagement. Roger Hallam and Dr Gail Bradbrook …..did some thinking and talking…..and following discussions with others a movement was born. The focus since then has been on speaking to people either online or in town halls. Fellow founders such as Robin Boardman has visited towns across the UK and the response was huge. Q.How are you funded? And what do you spend the money on? For this 2 period of Rebellion we have been raising money from crowdfunding, major donors, NGO’s and foundations, with the majority coming once again from online crowd funding (63%). 3% of our volunteers are given volunteer living expenses, our transparency about who and why is here . We are clear about spending conscientiously, and records of our payments to date can be found here. After April we will be moving to a new financing system. Our finance policies can be found here. Q. Most of your workers are volunteers. Aren’t you just relying on unpaid labour? 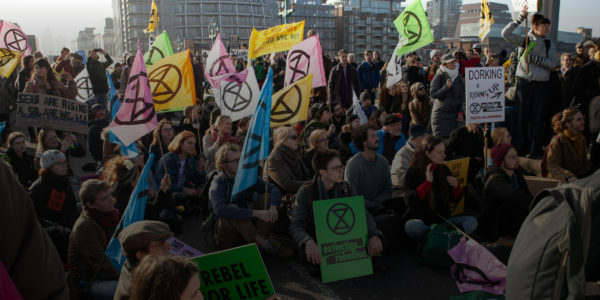 Extinction Rebellion has grown very quickly and there are large numbers of people who want to give their time for free because they realise the urgency of the situation. We even have individuals who have given up their paid jobs in order to work for Extinction Rebellion. However, this is not possible for many and so are experimenting with a system where we give money to vital members of the team who require assistance to pay living expenses like rent and bills. This isn’t ideal but hopefully means that we can spread our funds between the work we do and paying people. We will see how it works and change it if needs be. Why are you distracting police resources away from the fight against knife crime? It shouldn’t be either or – in fact, the lack of government action to fight knife crime and lack of government action on climate crisis are two sides of the same problem. (The police have been vocal in their criticism of government cuts in response to recent stories about rising knife crime). Crime increases in polluted cities. We wish we didn’t have to distract police resources. Extinction Rebellion is made up of ordinary people with jobs, families and responsibilities. 80 year old grandfathers would rather not be putting themselves in the physically uncomfortable position of being in a police cell and children don’t want to be skipping school – but 30 years of government inaction have left us with no choice. What is your policy on emergency vehicles? We have no intention of delaying emergency vehicles and are working with the police to make sure this doesn’t happen. Giving notice to the police allows plans to be put in place to reroute vehicles. Q. How can you justify the inconvenience and loss caused to businesses and individuals as a result of your actions? What if someone loses their job because they are late for work? We wish it wasn’t necessary and it’s not something we do lightly. Extinction Rebellion is made up of people who also have jobs and responsibilities and we do not want anyone to be inconvenienced or worse as a result of our actions. But the reality is we will all suffer because of government inaction on climate collapse and biodiversity loss. They are failing us and it’s putting all our lives, jobs and homes at risk. Credible commentators say that the economy will collapse on a heating planet, that society could collapse. Sir David Attenborough is on record speaking of this possibility. We would encourage anyone who feels upset or angry by our actions to find out more about the severity of the ecological and climate crisis. Q: Are things really that bad? Please refer to the Emergency section on our website. Q. The government is acting, indeed some people say the UK is global leader on climate change. Is your response proportionate? In order to limit warming to 1.5ºC recommended by the IPCC report, global net CO2 emissions need to decline by about 45% from 2010 levels by 2030. Despite initial progress on cutting its carbon emission, the UK will miss legal climate targets without urgent action. The UK Government is believed to overstate its progress on cutting emissions by leading climate scientists by not including the effects of shipping, aviation and consumption. Q. Why do you think you could succeed? We don’t know if we will but we can no longer stand by and act as if the future doesn’t matter. We are now on the brink and the only option left is civil disobedience, to disrupt the ordinary working of things, so that decision makers HAVE to take notice. Q. Aren’t you just a bunch of law breaking anarchists or economic terrorists or eco-fascists? Why should anyone listen to a bunch of people who actively try to get criminal records? Extinction Rebellion is an international movement with (as of April 2019) 650 groups in 45 countries. World leaders have failed to adequately confront the emergency and polite lobbying, marching, voting, consumer- and shareholder-activism, whilst having some value, have failed to turn the situation around. We are now on the brink and the only option left is civil disobedience – to disrupt business as usual, so that decision makers HAVE to take notice. Ultimately, we are doing this because it is the right thing to do. Climate change isn’t only about obscure weather patterns or failed crops it’s about everyone, including all our loved ones and all life on Earth, being at risk. As a network called Rising Up! we have run a number of dynamic campaigns and protests such as Stop Killing Londoners and Toxic Bankers, as well as multiple successful Fossil Fuel Divestment campaigns. You can see some of the things we have done in our youtube channel and the final part of this talk runs through a few of our previous campaigns. Q. You have been reported in the press for allegedly “smashing windows”, what are your views on Criminal Damage? We engage in peaceful civil disobedience to draw attention to the key issues of our time. We remain strictly nonviolent. Some of our activists have been charged for criminal damage for using paint on windows (often chalk based) to highlight certain issues. We have resorted to breaking windows in a couple of campaigns, this is called an “escalation strategy” and it is necessary to create the drama to focus attention on an issue. We are super careful to do this safely and not put anyone at risk. We do not consider minor property damage to be violent since no person is hurt. The CPS gives Lawful Excuse to those who “intended to use or cause or permit the use of something to destroy or damage it, in order to protect property belonging to himself or another or a right or interest in property which was or which he believed to be vested in himself or another”. According to research on conflicts between non-state and state actors around the world between 1900 and 2006, it was found that 53% of nonviolent campaigns were successful as opposed to 26% of campaigns that used violence. Moreover, of the violent campaigns, 95% had descended into dictatorship or totalitarian rule within five years. Others may debate this data and we do not judge those in struggles that have resorted to violence. Some of us are non-violent for tactical reasons and some for moral reasons. A. Rising Up! is the group that set up Extinction Rebellion as a project. Rising Up! has been around since 2016 and has run a variety of campaigns. Compassionate Revolution was set up in 2015 to try to build mass civil disobedience through an online platform that could capture people’s conditional commitments – “I will do this if other people do”. The website and company (for reasons of legal convenience) were used to establish Rising Up! Our bank account is in the name of Compassionate Revolution as a result. Compassionate Revolution Ltd currently has three Directors- Gail Bradbrook, Roger Hallam and George Barda. Although it is a company limited by shares (which we were advised would be easiest to set up and run), the organisation is not for profit and HMRC has therefore agreed that we do not have to pay any tax. Q. Are you really grassroots? A. Yes. We are ordinary people who care deeply about the world and want to do whatever we can peacefully to stop the destruction of Life on Earth and the deep injustices we see, and to push for the better, fairer and more beautiful world that we all want to see. No one controls us or tells us what to do. Q. Who are your founders? A. Rising Up! was founded by Roger Hallam, Gail Bradbrook, Simon Bramwell and others. In Winter 2016 we were joined by Stuart Basden, Ian Bray. Other founders of Extinction Rebellion campaign include Robin Boardman, Clare Farrell, Nils Agger, Frieda Luerken and Sibi. Q. “Some people seek to mobilize people around a general concern, like climate or war or poverty, but such mobilizations are like one-off protests—they don’t win anything”. Care to comment? A. Our understanding (from This is an Uprising book) is that you can have both structural and prophetic demands and that both have their value. Structural demands (e.g. we want a 20 mile an hour speed limit here or we want to ban fracking) are more associated with the structure based organising tradition of Saul Alinsky, Ella Baker etc and prophetic demands (we want civil rights) are associated with mass mobilising traditions. In training from the Ayni Institute, we learned that a hybridisation of both of these is the most effective path to take. Our Extinction Rebellion demands take that hybrid approach. Q. How are you really different to Greenpeace? They do civil disobedience too. They are a large NGO with a business model that probably limits their willingness to mass mobilise people in civil disobedience. The civil disobedience they feel able to undertake is limited to small teams of people. We believe that mass civil disobedience is the only way we will see vital and inspiring change on the scale that is needed. Q. Your campaign seems to focus on mass disruption. Are you not scared about what damage you might do to people’s lives? Before starting Extcintion rebellion the network Rising Up! partially shut down Heathrow Airport on two occasions and carried out many road blocks to test how to safely do these actions. We are always concerned about causing inconvenience to people and it doesn’t feel good when you learn someone missed an important event like a funeral or a hospital appointment. We are doing it as we believe we have to look at the bigger picture of how many people are dying today and how dire our trajectory is (the extreme being that human extinction is a very real possibility). In the face of this we accept that we inevitably cause inconvenience to people. We sincerely apologise to them. We are firmly and collectively of the view that, given the dismal failure of world leaders to date, disruption is now necessary to get anything like commensurate change. If there was a better, less disruptive way of doing this we would do that instead! Many of us have faced arrest, fines, convictions for our actions; some of us have been on hunger strike and gone to jail. So we are willing to take the consequences of our actions and to make personal sacrifices in order to do them. Business as usual is simply no longer a viable option. Q. What if an ambulance doesn’t get to the hospital in time because it is delayed by you, and someone dies? When there are traffic jams, ambulances are redirected by their HQs. If the ambulance is already very close to the roadblock, it is let through by the protesters. We usually advise of disruption before it happens, there are frequent traffic jams in London due to all manner of things such as road works and accidents and the services have strategies for coping with them, we aim to give them the necessary advance warning so they can alert crews and re route on the day. Q. Your demands are vague, why do you think you can achieve them? A. This is probably because we have to write things down in short ‘soundbites’ that are communicable as headlines. There is much more detail underneath them. We are using cutting edge techniques to build a resilient mass movement. We know the task ahead is daunting and therefore that the likelihood of success may seem slim, but we are willing to do all we can to try and achieve this. Ultimately though, we are doing this because it is the right thing to do, in part we remain unattached to outcomes, meaning that although we hope we can save something of life on earth we try to stay motivated by action being the right thing to do (virtue ethics) rather than taking action because we think it will work (utilitarian ethics). However, the more of us that act on this basis in the face of the galloping global assault on our children’s futures, the more likely we hit the tipping point where the impossible becomes inevitable. A.We do our very best to ensure that everybody taking part in non-violent civil disobedience in defense of the planet, whether experienced or not, understands the risks they are taking and the potential consequences. We run trainings in nonviolent direct action and have a legal team that provides arrestee support and access to supportive solicitors..
We understand that this is an important element of movement building and disrupting everyday life / perceived normal reality, to create a national conversation on the climate and ecological crisis. As George Monbiot put it in his inspiring speech on 31st October 2018 at our Declaration of Rebellion against the UK Government on Parliament Square: “The only time that people know it is serious, is when people are prepared to sacrifice their liberty in defence of their beliefs”. Q. Are you a registered company? What kind? Do you file audited accounts? Yes, for historical reasons our company is called Compassionate Revolution Ltd. Its Directors are Gail Bradbrook, Roger Hallam and George Barda. It is a company limited by shares but we state clearly online we are not seeking profits and we are understood to be a not-for-profit by HMRC. Q. Are you a charity? A. No, charities are limited by law in both what they can campaign for, and the strategies permitted them; such as civil disobedience, which has been central to most chapters in the inspiring story of social progress. SOme organisations set up a separate charitable wing for their educational work. Q. What is your structure, how do you organise? A. We are a decentralised organisation – anyone can do things in the name of Extinction Rebellion if they agree with and adhere to our principles and values – people don’t need anyone’s permission on that basis. We have a self-organising system. Power is invested in roles through the use of mandates rather than held by people. It is a creative system that grows in response to the organisations needs. We organise in circles focussed on actions, political strategy and movement support. Teams focus on Media and Messaging, the Citizens Assembly, Finance and Fundraising, Legal, Training, Actions, Art, Tech and Communities, Internationalist Solidarity team and a Guardians team who link to an independent Counsel for support and guidance. An overall anchor circle meets to share information and resolve issues that lack clarity. For the rebellion period a Rapid Response Team was established to make faster decisions on strategy and issues, this include representatives from various UK based teams. We are considering how well a structure works at a UK national level. This structure may be useful to copy in other circumstances, but other countries, local groups and so on, in this way a fractal structure. We are figuring all this out with support of a Self Organising System Team. Q. How do you make decisions? A. We use different decision making thresholds that are appropriate and practical and chosen by each area. The co-ordination circles use an integrated decision making process which intends to support collaboration and creativity by needing all proposals to pass with ‘’no objection’. A. People have a variety of views of what democracy means – it tends to be associated with voting. We don’t have a system where everyone votes on everything – we haven’t set ourselves up as a consensus based organisation. Our experience is that this clogs things up and can hold back effective action. The self organising system is in principle dynamic and responsive to the needs of a growing and rapidly changing organisation. The development of a feedback system, which we are working on, is integral to our growth in supporting people to be heard. Q. How are these decisions transparent and accountable? A. People have access to our organising documents, proposal process, etc through our campaign overview document and through conversations on our organising platform Basecamp. We record some of our meetings and post them in basecamp. As in many areas we believe we need to improve our practice. Q. I’ve heard Extinction Rebellion described as a con, a trick, a conspiracy, promoting 5G etc. How do I know you are the real deal? A. We assume that attacks on us as a network and on individuals will increase as we gain more publicity. We are ordinary people who have done a variety of jobs in our lives, we are doing our best to make a difference in the world. Q. Do you not realise you are promoting an eco fascist agenda? A.We are not promoting an eco fascist agenda, we think if society collapses, eco fascism is a significant risk. We seek a genuine democracy that dethrones the corrupt incumbent interests that continue to undermine democracy and that have held back change for so long – and with such lethal consequences. We proceed mindful of constant attempts by powerful interests to capture and hollow out movements for meaningful change. This is a key reason we are demanding a national Citizen Assembly, populated by ordinary people chosen at random, to come up with a programme for change. Q. I’m worried that you are asking Government to move to emergency mode. Will we not see the shock doctrine in action when that happens? A. Our third demand is for a Citizens Assembly (CA) to define the changes, so that we aren’t handing more power to our Government. We understand that the structure of government in this country has the ability to implement the necessary changes, in partnership with local communities, but that our democracy is inadequate to overseeing this and so it needs changing. Hence the CA demand. A Citizens Assembly is a bit like jury service here in the UK. You get called up completely at random. The idea is that the group forming the jury represents a cross-section of society. The same goes for a Citizens Assembly. A process called ‘sortition’ is used, where random people will get selected to be on the Citizens Assembly. Have a look at the Sortition Foundation’s website where they explain more about this process. Using a Citizens Assembly rather than getting our current politicians to try and resolve the issues of climate change will mean more transparency and real commitment to find a true solution, rather than one that will only work for the few. Q. Is your movement just reductionist? Are you just advocating a technical solution? A. We do not put forwards specific solutions – it is down to the Citizens Assembly to come up with solutions, having first heard from various experts. The way we frame the question for the Citizens Assembly will mitigate against narrow solutions that are ineffective for dealing with the wider contact and system-wide issues. Q. Your movement seems a bit woowoo to me, what’s with the shamans and all that? Some, though not all of us, have a “spiritual” orientation and we welcome anyone regardless of their beliefs. We think that people protect the things that they love and that embracing our love of life and the natural world is not something we should shy away from. That said, we are not naive or uninformed about social and economic justice. Q. Don’t you realise that if people get arrested who are black they will get far worse treatment? And aren’t you too nice about the police? A. Yes, we are aware of the structural racism in our policing and legal system. We give people information about arrest and those of us who are white have acknowledged our privilege, in the likelihood that we will be treated differently / better than our colleagues of colour. People can take a variety of roles. We think it’s important for white people to use their privilege. People of colour (PoC) have been more at risk for generations in defence of the environment and their lands, both here in the UK and around the world. It is time to for white people to take this risk too so that PoCs, who are threatened by structural racism, don’t have to. The ecological crisis affects PoC more than it does white people currently. Environmental activists of colour in other countries have been killed for defending their land. We also try to acknowledge the police as human beings and to be respectful during our protests, but this does not make us naive about what the police have done to activists and communities in the UK. Activists have been subjected to lies, assault, the spy cop trauma and worse. Q. Why do you talk to the police when they aren’t to be trusted? We take a no blaming and shaming approach to the police and from our non violent discipline we agree to treat the police with respect. We are making the strategic decision in some countries (including the UK) to liaise with the police, believing this will be more likely to support our goals. This is for specific countries to figure out, taking into consideration their own circumstances and the potential strategic opportunities that have been described. Q. Aren’t you just further enabling Agenda 21? A. Agenda 21, like many other programmes, had no legal basis for change and therefore was ineffective. We seek a legally binding change, with a Citizens Assembly in charge. Q. I don’t believe the welfare of the less experienced people is likely to be very important in your group. What measures have you got in place to protect people? A. We have an approach of what we call ‘regenerative culture’ in Extinction Rebellion, where we ask people to look after themselves as part of being involved. We have a team that aims to ensure support is in place, before, during and after actions. We ask affinity groups to assign a well-being person to each group. However, there is limited capacity and we work very hard to make people aware of the risks they are taking. So this is an important issue to us. Q. Are you professional lifestyle activists? A. Many of us have made significant personal sacrifices in order to follow our convictions and help others. Professional imples someone is paying us to do this. No one is paid as “staff” 3% of us receive what we call Volunteer Living Expenses. We care deeply about the situation we find ourselves in and many of us have oriented our lives in service to making things better. If by professional you mean organised and committed then yes in our attitude we try to be. Q. Aren’t you alienating a lot of the people that you should be working with? A. Yes, we may be. There is far less awareness than we need in the public around just how bad a situation we are in, though there are signs that this is finally and rapidly improving. This goes to the very heart of the problem. And so, yes, people who do not understand, or who through denial reject the gravity of the situation being laid out by scientists, may find it easy to disagree with the actions and find us alienating. The aim is not to alienate people, of course. The aim is to make these most critical and urgent issues of our time finally unignorable to decision makers. If they want less disruption, they must act. Social movements are often unpopular – one of their job is to create conversations about key issues. Q. Aren’t you taking energy away from the frontlines of environmental activism? A. We stand in solidarity with all those fighting frontline issues. On our core team / main organisers, we have supported and / or organised actions related to Heathrow, incineration, fracking, HS2 and Pont Valley. We have been arrested fined, gone to jail, gone on hunger strike. We will support front line activism as much as we can, but we think it is also important that a whole systems approach is taken which is about mass civil disobedience aimed at the seat of power. Front lines keep opening up because the system is toxic. Q. What credentials do you have to be doing what you are? Who are you? A. We started as a group of activists who have been working together since 2016 in a group called Rising Up! We are behind Extinction Rebellion right now, though our aim is to support other people to get involved, we do not intend to hang on to the decision making processes. In 2016, people from several groups (Like Earth First! Occupy Democracy, Plane Stupid, Reclaim the Power) were asking how to design a strategy that might win. Roger Hallam was writing about How to Win! and Gail Bradbrook has designed an online system for collecting “conditional commitments” as part of Compassionate Revolution, which was created after Occupy Democracy. Both were trying to find others to discuss and create a new strategy. A draft strategy was created in the summer of 2016 and Rising Up was launched in autumn of 2016 during an action at Heathrow Airport. We are helping to organise many ordinary people who care about the issues to take meaningful action that could elicit change. Q. So you get to sit down with the government, what would you say? A. Do you understand how bad things are? If so what is stopping you from making the changes that are needed? We are focussed on developing a mass movement of civil disobedience and we have no intention of stopping until we deal with the crisis we are in. The climate and biodiversity crisis requires urgent and drastic action to decarbonise the economy as quickly as possible. How can you possibly promote fracking in the face of that, using taxpayers money?! Or push for a third runway at Heathrow?! Or reverse the expansion of renewable energy?! Q. Aren’t you just a group of middle-class left-wing activists? Why should anyone listen to you? Extinction Rebellion is made up of people from all ages and backgrounds and locations from all over the world. From under 18 to over 80 year olds – there are thousands of people willing to put their liberty on the line to fight the climate and ecological emergency and protect biodiversity and atmospheric health. Q Where do you stand on Brexit? Are you just a bunch of London centric remoaners? We take no position on Brexit except to say that it is distracting us from the real emergency which is biodiversity loss and the climate catastrophe. Extinction Rebellion has members across the UK and the world. Q. Who is behind XR? QUESTION: How are you funded and how do you allocate your finances?